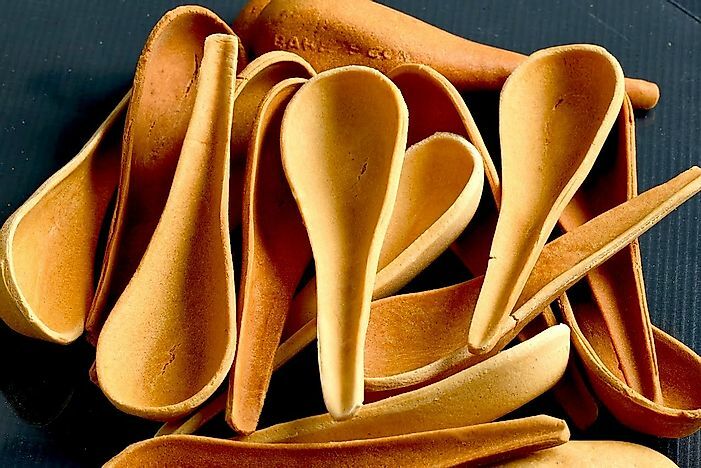 Reducing Plastic Waste: Could Edible Cutlery Be the Answer? In a world where billions of plastic cutlery pieces end up in landfills each year, one environmentally-minded entrepreneur has conceived of an idea that is both ingenious and tasty. Edible spoons produced by Edible cutlery of Bakey's, the project of Indian Entreprenueur Narayana Peesapaty. For decades, the issue of non-recyclable plastic garbage piling up in the landfill sites have greatly distressed environmentalists and governments across the globe. Repeated attempts have been made to find a permanent solution to this gigantic environmental issue. However, as well-intentioned as this quest may be, sustained demands for plastic products continue to encourage the production of plastic. On most occasions, people have failed to find a perfect alternative to plastic products. The need for alternatives has also triggered concerned entrepreneurs of the world to rack their brains to discover or invent the perfect product to replace plastics. Edible cutlery of Bakey’s is one such innovation by entrepreneur Mr. Narayana Peesapaty from Hyderabad, India. It promises to replace non-recyclable plastic cutlery with zero-waste edible cutlery. Plastic is almost everywhere around us. Numerous objects of our daily use like water bottles, storage containers, cutlery, toys, and more are made of plastic. There is no doubt that plastic has made our lives easy, but it is also true that in the long-term, plastic waste has a major adverse impact on our health and the health of the environment around us. With growing populations and increasing consumerism, the production and sale of plastics has soared, and so has the problem of plastic waste disposal. A report by The Economist mentions that since the 1950s, the world has produced an estimated 6.3 billion tons of plastic waste. Only 9% of this waste has been recycled and 12% has been incinerated. Plastic waste comes in all forms and sizes including plastic cutlery that is widely used by food service businesses and restaurants worldwide. There are several advantages associated with the use of plastic cutlery such as the low cost and the disposable nature of the cutlery. Every year, 120 billion pieces of plastic cutlery are discarded in India. Billions more are added to dumping sites in the rest of the world. Toxic chemicals leaching out from the discarded plastics often enter the water bodies that are a source of drinking water for humans. Accidental consumptions of plastics also kill animals. Marine species often get entangled in submerged plastic debris. The action of salt water and solar UV rays also break down plastics to microscopic particles in the oceans. These microplastics enter the food chain via the marine fauna and enter our bodies through seafood. It’s easier to establish that plastic waste is a major environmental pollutant. What’s harder is finding an alternative to every product made from plastic. However, it is vital to reduce the demand for such products in the market in some shape or form. One such form is through edible cutlery or simply, cutlery that you can eat! Bakey’s, the company that produces edible cutlery, was founded in 2011 in Hyderabad, India, by Mr. Narayana Peesapaty, a former researcher with the International Crops Research Institute for the Semi-Arid Tropics (ICRISAT). The company produces a range of cutlery products like spoons and forks. According to the Bakey’s' website, the cutlery is manufactured using edible raw materials. Flours of millet, rice, and wheat are mixed with water and baked at high temperatures to produce the dehydrated, hard, and crisp cutlery. No chemicals and preservatives are added to the products. Despite being edible, the cutlery has a long shelf life when unopened, and can also be used to consume hot soups or other liquid food. The cutlery even comes in the three different flavors of plain, sweet, and savory. Rock salt, carom seeds, cumin seeds, and black pepper are added to make cutlery of the savory flavor. Even vegans and vegetarians can use this cutlery. To learn more about the production of edible cutlery at Bakey’s, World Atlas caught up with Mr. Narayana Peesapaty. He spoke to us about what first triggered him to establish Bakey's. Two and two came together for Mr. Peesapaty while traveling on a flight where he was served refreshments with plastic cutlery. At that time, he started wondering about the future of all the plastic cutlery served on the flights across the world, and the massive amount of waste that is generated from this practice. Lost in his thoughts about how to solve this crisis of accumulating plastic waste, an inventive idea struck him. Recollecting his previous experience with hardened millet bread, Mr. Peesapaty knew that millet was the magic ingredient that could help him produce cutlery that would replace plastic cutlery. Bakey's edible cutlery packed and ready for sale. Photo credit: Bakey's Edible Cutlery. In the beginning, things were not easy for Mr. Peesapty and he met with several challenges to build a market for the edible cutlery produced at Bakey's. However, the diligent entrepreneur did not lose hope and his patience soon bore fruit as the market suddenly started to grow. As demands for his cutlery poured in from all corners of the globe, Mr. Peesapaty struggled to keep up with the production of the cutlery. Soon, he started sharing his technology of edible cutlery production with others by selling machines used to produce the cutlery. Mr. Peesapaty also explained the advantages of using edible cutlery over plastic ones He said, “The character of a plastic spoon hardly changes even after multiple uses. Therefore, there is a high opportunity for the unscrupulous food vendors to pocket more profits by putting the cutlery to unhygienic reuse." "This practice would make the user susceptible to infections,” he warns. However, edible cutlery, he said, cannot be reused. Once the package is opened, the piece of cutlery has a short lifespan of just 3 to 7 days. If not consumed by the user,it can also be eaten by animals like insects, cows, goats, and birds. It can even be used to fill up the compost pits. Thus, unlike plastic cutlery, edible cutlery is highly biodegradable and can act as a source of nutrients for other creatures of nature. “Cutlery is an interesting FMCG (fast-moving consumer good) product where the bulk purchaser is not the end user. The purchasers are the food vendors, caterers, etc. The end users are the common people who are now demanding to shift to edible cutlery, and that is how we are getting orders. A few event managers came over to us asking for edible cutlery due to the insistence of their customers. So, the revolution is happening, albeit slowly."